Providing freewheel clutches with an adequate supply of GMN selected lubricants ensures correct performance and a long service life. GMN sprag type freewheel clutches are suitable for oil or grease lubrication. All GMN freewheel clutches without seals are delivered with an effective corrosion protection and have to be greased by customer. GMN offers sprag type freewheel clutch units and ball bearing freewheel clutch units sealed on both sides with operative lifetime lubrication. The lubricant qualities and quantities selected by GMN ensure unrestricted capability for the freewheel clutch over its entire service lifetime. Further lubrication (re-lubrication) for freewheel clutch with lifetime pre-lubrication is not necessary. Custom solutions for reliable lubrication under exceptional operating conditions, extreme operating temperatures or for vertical installation position applications are possible on request. An insufficient supply of lubricant, deviating lubricant qualities or the use of lubricants with friction reducing additives (such as MoS2 or graphite, for example) can cause serious functional impairments or damage the freewheel clutches. The use of lubricants from other manufacturers which have equivalent compositions is possible. 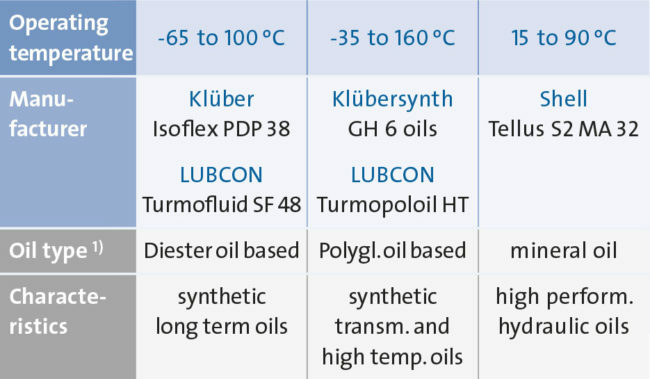 The compositions and characteristics of the specified lubricants can change due to technical advances and may necessitate retesting with respect to lubricant qualification for GMN freewheel clutches. All specifications reflect conditions as of June 2013. Oil bath or oil mist lubrication is particularly well suited for high operating requirements with respect to rotation speeds and indexing frequencies. Sprag type freewheel clutch units: Series FPD, FND and RA with GMN rubber seals. GMN sprag type freewheel clutches are sealed on both sides and have lifetime oil lubrication (Shell Tellus S2 MA 32) suitable for operating temperatures from 15 ºC to 90 ºC. Other oil types for different temperature ranges are available on request. Lubricants of the given oil type can be mixed. Mixing combinations of different oil types is not permissible. Lubricant qualification selected common commercial motor oils are suitable for reliable re-lubrication. HD motor oils SAE 10 W or SAE 30 conform to “API SF/CC” as well as “MIL-L46152B”. Adequate pre-lubrication and re-lubrication is necessary for freewheel clutches in open housings. Such lubrication must accommodate the given freewheel clutch size and the structural characteristics of the mating parts. For horizontal installation positions, the freewheel clutch should be about 1/3 submerged in the oil bath when at state of rest. Hydraulic oils HM 10 and HM 32 are suitable for oil mist lubrication with respect to operating temperature. Oil mist lubricated applications are based on a constant supply of sufficient fresh oil during operation. Economically efficient grease lubrication is sufficient for ordinary performance requirements. Grease types are distinguished by special characteristics which, because of their specific composition, fundamentally make them differ from one another. The selection of a suitable grease is to be made on the basis of specific operating conditions. GMN has chosen suitable grease types for differing operating conditions from DIN 51818 consistency classes NLGI 1 and NLGI 2. The lubricating grease chosen by GMN for greasing sealed ball bearing freewheel clutches (Klüber ISOFLEX LDS 18 Special A) is intended for applications under normal operating conditions. Other grease types for different operational conditions are available on request. Adequate pre-lubrication and re-lubrication are necessary for freewheel clutches in open housings. Such lubrication must accommodate the given freewheel clutch size and the structural characteristics of mating parts. All-over distribution of an adequate amount of grease (about 30–60% of the available volume in the freewheel) ensures an adequate lubricating effect.